With an eco-friendly and easy-to-use design, the Ricoh Aficio MPC5501 colour multifunction copier aims to please busy workgroups with its multifunction and colour printing capabilities. A single-function copier, fax machine, and scanner are all integrated into the full-colour multifunctional system MPC5501. However, the Ricoh Aficio MP C5501 colour laser printer is expensive and some important functions do not come as standard. The standard unit requires a little more installation space because it is 26.7 inches deep and 26.4 inches wide. It stands 30 inches tall but it comes with wheels for ease in mobility. The centrepiece of the Ricoh Aficio MPC5501 colour MFP is the oversized full-colour touch panel display, while the standard ports include Ethernet, high-speed USB 2.0, and dual USB 2.0 host interfaces. The entire MPC5501 printer runs on 2GB of RAM and a 1GHZ Intel Celeron M processor. It is great for growing offices because of the expandable memory and paper capacity. The Ricoh Aficio MP C5501 colour digital imaging system prints fast, at up to 55ppm in either colour or monochrome, and in 1200x1200dpi. It is also secure and consumes less energy when in operation. The large touch panel makes the Ricoh Aficio MPC5501 easier to manage and operate. A 100-sheet ARDF is included to help users save time and resources. Users may print directly from a digital camera or USB key. As well as having remarkable energy efficiency, the Ricoh MPC5501 uses productive toner cartridges that deliver 25,000 prints in black or 18,000 pages per colour toner. The Aficio MP C5501 colour copier is pricey and users may need to spend more if they wish to integrate the fax machine. It can be expensive to increase the paper capacity. 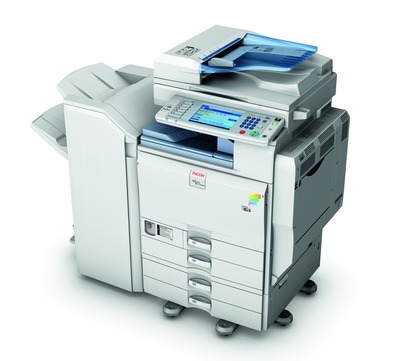 Wi-Fi, front USB 2.0, and Gigabit Ethernet are also optional for the Ricoh Aficio MPC5501 multifunction copier.